One of the very real – and unexpected – pleasures of travelling to out of the way archaeological sites is that I come across some wonderful trees. I’ve particularly enjoy discovering trees which have historical or literary associations. Take the Judas tree. According to St Matthew, Judas repented of betraying Jesus for thirty pieces of silver almost immediately, and returned to the temple to give back the bribe. He said, ‘I have sinned. I have brought an innocent man to his death.’ Their unfeeling reply was, ‘What is that to us?’ Judas flung the money down and left. According to legend, he then hanged himself from a Judas tree. It’s a very human story of a man giving in to temptation and then bitterly regretting it. 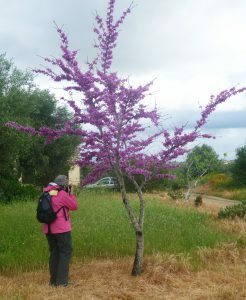 I’d never seen a Judas tree before and I was astonished by its vivid colour. Although this tree is not fully grown, it doesn’t look as if it will be a big tree; Judas must have been a light man. And that, somehow, gives the story an extra tragic dimension. My first sight of an umbrella pine was shortly after arriving at Naples airport; I’d come to visit Pompeii and I remembered Pliny’s famous eye-witness account of the eruption of Vesuvius. The explosion, he wrote, ‘can best be described as being like an umbrella pine, for it rose to a great height on a sort of trunk and then split off into branches.’ I recognized the umbrella pine instantly and was quietly thrilled. 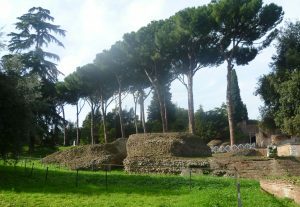 A couple of years later, I was visiting the Etruscan cemetery at Cerveteri and saw an umbrella pine close to for the first time. 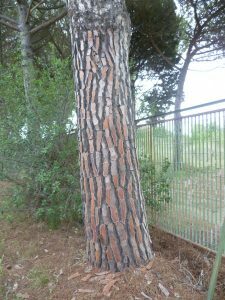 It has a very distinctive bark which reminded me of a giraffe’s neck. 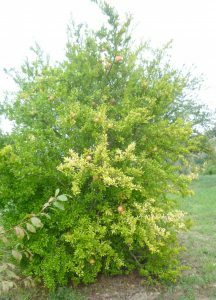 It was on the Etruscan trip that I saw my first pomegranate tree. I’d had a vague idea that they grew like tomatoes so I was surprised to find it was a small, bushy tree. The pomegranate features in Greek mythology. Persephone, daughter of the corn goddess Demeter, was carried off by Hades, god of the underworld, to become his queen. In her grief, Demeter vowed that the earth would be stuck in eternal winter until her daughter returned. Eventually a deal was struck. Because she had eaten six pomegranate seeds whilst in the underworld, Persephone could not return entirely. But she could return for six months a year; the spring and summer months, and for autumn and winter she would go back to the underworld. Such a dramatic story, I thought, for such an unassuming tree. 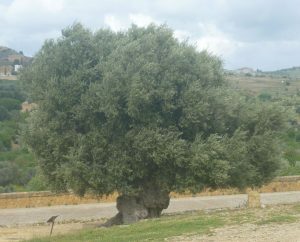 I had seen olive trees before and they are venerable trees. I have included this one from Sicily because it is a thousand years old; there is a notice saying so at the bottom left. It’s amazing to think that it was still a young tree, probably not yet fully grown, at the time of the Norman Conquest in 1066. I first came across Persian lilacs in the squares of Cairo and I loved their beautiful purple flowers. I finally discovered what they were when I saw them in Cyprus: syringe x persica. 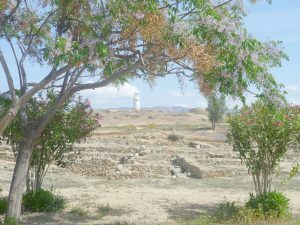 The Persian lilac in the photo forms an elegant arch (with an oleander on either side) and looks through the ruins of Nea Paphos, the first capital of Cyprus, which was built on a headland. There is a lighthouse in the distance. What is fascinating about the Persian lilac is that it has both seeds (the brown bits in the photo) and blossom at the same time. Historically, it features in Persian and Indian gardens, and the botanist, John Tradescant, brought it to England in the 17th century. Today, you can see them planted around the Royal Pavilion in Brighton. I don’t know if Persian lilacs were part of the original planting but they are suitably oriental trees to go with the architect John Nash’s fantasy pavilion with its domes and minarets. The terebinth, pistacia terebinthus, has Biblical associations. The prophet Hosea mentions ‘The terebinth’s pleasant shade’, and it’s an accurate description. 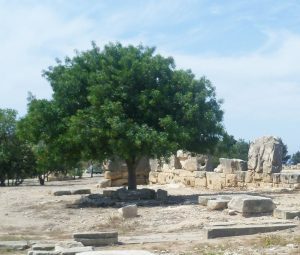 This terebinth is in the sanctuary of Aphrodite’s temple, at Kouklia, in Cyprus – the birthplace of the goddess of love. It was once the source of turpentine, and terebinth galls were used in tanning. Actually, I just like its name, which somehow hints at mystery. 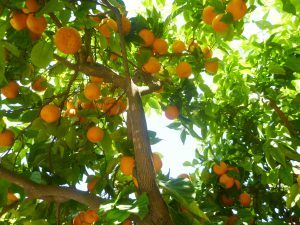 The Generalife gardens at the Alhambra in Granada, Spain, are simply wonderful, and I just loved the profusion of oranges with their vivid fruits and glossy green leaves. It was the sheer bounty of the fruit which attracted me and I thought it would make a suitable finale for this post. What an interesting post! I love the story about the Judas tree, the umbrella pines are amazing and the venerable olive – oh, wow! What a lot of history in these trees. Agree with you about Terebinth – a lovely sounding name – it reminds me of my stepmother’s name – Teruabine – she was from Kiribati and married my father in his elderly years. Sadly she predeceased him, dying of cancer in 2004. He managed another 4 years, but they were very happy for a good while. Thank you for your interesting comment, Elizabeth. I do love the stories you get with trees – like King Charles II hiding in the Boscabel oak whilst Roundheads prowled beneath looking for him. I like your stepmother’s name. It sounds as if it should belong to a flower. Gosh, what a lovely post. I had no idea the Judas tree was so purple! It was a real surprise to me, too! It’s almost as if someone has flung a pot of cyclamen-coloured paint at it. At least I can now instantly recognise a Judas tree when I see it! I really enjoyed this post – thanks Elizabeth! I especially like the mythology associated with trees. I agree, Nikki. I, too, love the mythology associated with trees – especially Greek mythology. There’s Persephone eating pomegranate seeds, and Daphne being turned into a laurel tree. And Shakespeare’s Prospero threatens to peg Ariel in the knotty entrails of an oak – which sounds exceptionally harsh.